Intel on Tuesday introduced its new form-factor for server-class SSDs. The new "ruler" design is based on the in-development Enterprise & Datacenter Storage Form Factor (EDSFF), and is intended to enable server makers to install up to 1 PB of storage into 1U machines while supporting all enterprise-grade features. The first SSDs in the ruler form-factor will be available “in the near future” and the form-factor itself is here for a long run: it is expandable in terms of interface performance, power, density and even dimensions. For many years SSDs relied on form-factors originally designed for HDDs to ensure compatibility between different types of storage devices in PCs and servers. Meanwhile, the 2.5” and the 3.5” form-factors are not always optimal for SSDs in terms of storage density, cooling, and other aspects. To better address client computers and some types of servers, Intel developed the M.2 form-factor for modular SSDs several years ago. While such drives have a lot of advantages when it comes to storage density, they were not designed to support such functionality as hot-plugging, whereas their cooling is a yet another concern. By contrast, the ruler form-factor was developed specifically for server drives and is tailored for requirements of datacenters. As Intel puts it, the ruler form-factor “delivers the most storage capacity for a server, with the lowest required cooling and power needs”. From technical point of view, each ruler SSD is a long hot-swappable module that can accommodate tens of NAND flash or 3D XPoint chips, and thus offer capacities and performance levels that easily exceed those of M.2 modules. 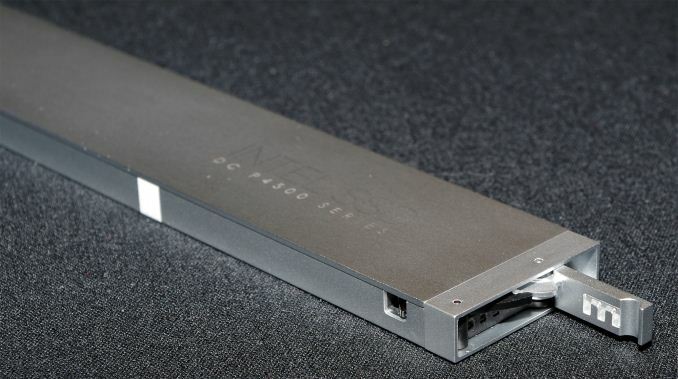 The initial ruler SSDs will use the SFF-TA-1002 "Gen-Z" connector, supporting PCIe 3.1 x4 and x8 interfaces with a maximum theoretical bandwidth of around 3.94 GB/s and 7.88 GB/s in both directions. 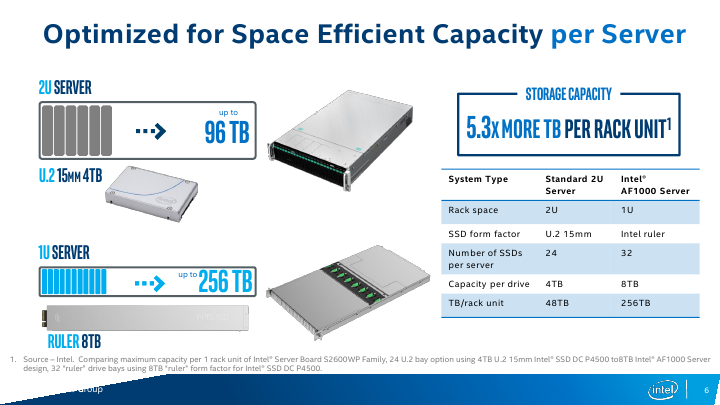 Eventually, the modules could gain an x16 interface featuring 8 GT/s, 16 GT/s (PCIe Gen 4) or even 25 - 32 GT/s (PCIe Gen 5) data transfer rate (should the industry need SSDs with ~50 - 63 GB/s throughput). 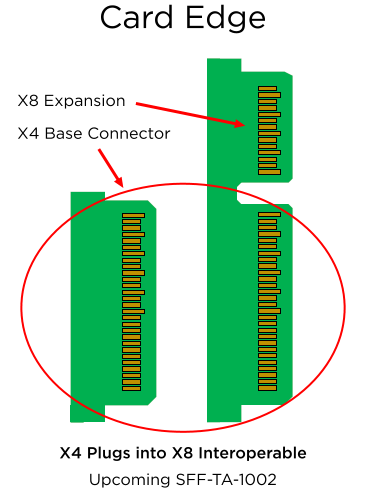 In fact, connectors are ready for PCIe Gen 5 speeds even now, but there are no hosts to support the interface. One of the key things about the ruler form-factor is that it was designed specifically for server-grade SSDs and therefore offers a lot more than standards for client systems. 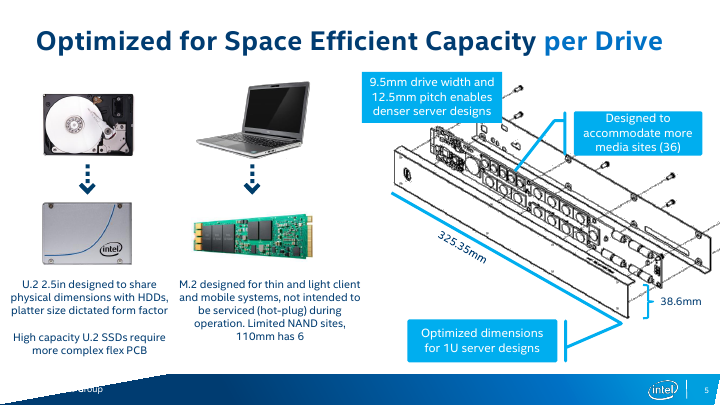 For example, when compared to the consumer-grade M.2, a PCIe 3.1 x4-based EDSFF ruler SSD has extra SMBus pins for NVMe management, additional pins to charge power loss protection capacitors separately from the drive itself (thus enabling passive backplanes and lowering their costs). The standard is set to use +12 V lane to power the ruler SSDs and Intel expects the most powerful drives to consume 50 W or more. Servers and backplanes compatible with the rulers will be incompatible with DFF SSDs and HDDs, as well as with other proprietary form-factors (so, think of flash-only machines). EDSFF itself has yet to be formalized as a standard, however the working group for the standard already counts Dell, Lenovo, HPE, and Samsung as among its promotors, and Western Digital as one of several contributors. It is also noteworthy that Intel has been shipping ruler SSDs based on planar MLC NAND to select partners (think of the usual suspects - large makers of servers as well as owners of huge datacenters) for about eight months now. While the drives did not really use all the advantages of the proposed standard – and I'd be surprised if they were even compliant with the final standard – they helped the EDSFF working group members prepare for the future. Moreover, some of Intel's partners have even added their features to the upcoming EDSFF standard, and still other partners are looking at using the form factor for GPU and FPGA accelerator devices. So it's clear that there's already a lot of industry interest and now growing support for the ruler/EDSFF concept. 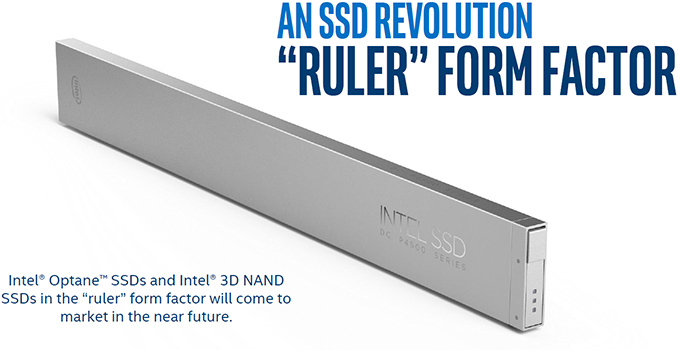 Finally, one of the first drives to be offered in the ruler form-factor will be Intel’s DC P4500-series SSDs, which feature Intel’s enterprise-grade 3D NAND memory and a proprietary controller. Intel does not disclose maximum capacities offered by the DC P4500 rulers, but expect them to be significant. Over time Intel also plans to introduce 3D XPoint-based Optane SSDs in the ruler form-factor. That is assuming you can even fit 16 drives in 1U rack - I saw one with 10 drivers but not sure it is 1U. "That is assuming you can even fit 16 drives in 1U rack - I saw one with 10 drivers but not sure it is 1U." It is fair if you consider online serviceability and not just density. 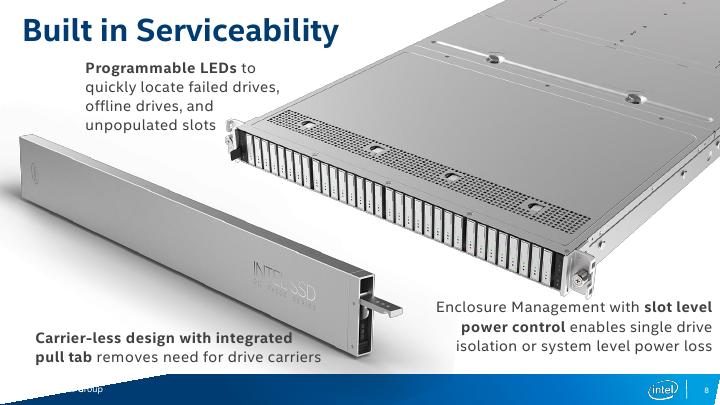 Stacking drives in the Z-dimension (depth-wise) in a high-density storage server leads to lower serviceability since you need to -- at the very least -- pull the entire server or a multi-drive sled forward out of the rack to access the drives that are sitting behind the front row. If you chose not to install rear cable management on the server that allows you to pull the server forward while it is live to perform this potentially delicate internal operation, you would need to shut the server down and disconnect it first before pulling it out to replace a drive.